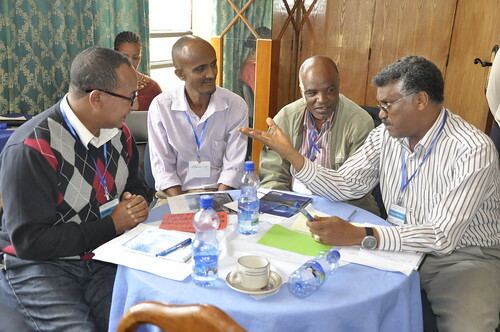 On 23 and 24 July, the Nile BDC organised a regional stakeholder dialogue in Bahir Dar to share emerging findings on land and water management with partners from Ethiopia’s regions and explore how to institutionalize a regional platform for NRM. It built on the messages emerging from the recent NBDC science meeting. Second National Platform meeting on Land and Water Management in Ethiopia: Time for action! Various national and regional organizations in Ethiopia are engaged in natural resource management, particularly in land and water, but for the last 30 years there has been limited opportunity for them to share experiences, identify gaps and feed key insights to one another and crucially to policy-makers. Earlier this year, the Nile Basin Development Challenge (Nile BDC) initiated a National Platform on Land and Water Management along with key national players. There was a widespread agreement that a well negotiated national platform can be a relevant mechanism to minimize duplication of efforts and enhance communication between actors and across sectors for improved land and water management in Ethiopia. 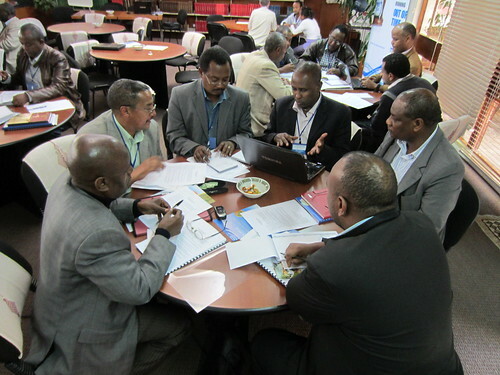 On 19 December 2011, the second national Platform meeting on Land and Water Management was held at the Addis Ababa campus of the International Livestock Research Institute (ILRI). About 30 participants representing governmental organizations and ministries, non-governmental organizations and development associations, universities and research organizations came together to talk about the objectives, functions and structure of the national platform, and to identify priority areas and approaches to address them. Download the report of the meeting. While National Platform meetings are expected to take place twice a year, the idea is to have thematic working groups develop an action plan around priority areas with several activities throughout the year that will feed back to the national platform meetings. These meetings are also meant to invite other organizations and networks to introduce various initiatives of relevance to each group. After an introductory presentation on the platform itself, the MERET program and RiPPLE presented their experiences linking local practices with national planning. The Management of Environmental Resources to Enable Transition to better livelihoods (MERET) program has a long history in Ethiopia and has evolved from the Food for Work (FFW) program in the 1980s to a Community-Based Participatory Watershed Management Approach (CBPWSM) in the 1990s, eventually morphing into MERET in 2003. The program also faces various challenges such as resource limitations for scaling up and out, lack of cash for promoting income-generating activities, absence of impact studies and documentation of best practices, limited exposure to innovative technologies from elsewhere, institutional instability and frequent staff turnover. The factors influencing the sustainability and success of RiPPLE include: working closely with interested partners who directly benefit from the alliance, institutionalization of activities and approach in governmental organizations, working on key challenges by building on existing initiatives and using experienced process facilitators, ensuring linkages to implementation projects, organizing regular training courses for Training and Vocational Education Centers and other parties. The whole RiPPLE approach has been followed with an eye for ensuring institutional and individual commitment through shared ownership. The participants developed action plans for each of these groups and identified champions to lead small working groups around each theme from January 2012 onwards. The working groups are expected to identity key issues and challenges, document ongoing experiences and disseminate information that is already available, identify research gaps etc. In addition to a common agenda across the groups, each group may have it own priorities and activities. The Nile BDC will initially support the platform through providing facilities and infrastructure, but over time additional sources will have to be mobilized, hence the importance of building upon existing initiatives. Since the platform intends to become the nationwide forum for information exchange, learning and innovation on land and water management, by linking local experiences to national planning, it is of great importance that organizations and institutes working on land and water management in Ethiopia actively participate and contribute to the working groups and the national platform. To play an active role in role in one of the working groups or to keep informed about the national platform, please contact Tsedey Ayalew (t.ayalew AT cgiar.org) or Kees Swaans (k.swaans AT cgiar.org). Read the report of this second national platform meeting.